Leah Dorion is a multidisciplinary Métis artist, writer, teacher, and filmmaker from Prince Albert, Saskatchewan. Métis history and tradition strongly shine through all her works, written and visual, and the artist credits her heritage as a means of “providing her with a unique bridge for knowledge between all people.” (Leah Dorion’s Official Site) Themes from traditional Métis cultural are often the focus of her painted and printed works. She draws on themes of traditional spirituality and the balance of the four sacred elements of life. Also, a focus on women is often prevalent in her work. She portrays the strength of Aboriginal women and highlights the many important roles that they hold, such as storytellers. Her works often are made from a variety of media. Dorion often mixes traditional art materials like paint with “beads, birch bark, river rock, and shells.” (Leah Dorion’s Official Site) The incorporation of these materials is a nod to some of the materials popularly used in traditional Aboriginal art while adding a dimension of depth and texture to the work. Many of Dorion’s painted works draw on these materials using built-up paint and patterns to reflect these other materials. Her work Playing With Toy Horses uses a pattern of swirls and circles that are reflective of the patterns made when beading. The figures wear traditional Métis clothes, pointing again to Dorion’s heritage. Similar to many other Aboriginal and Métis artists, Dorion’s work has found ways to draw inspiration from the past into the present. 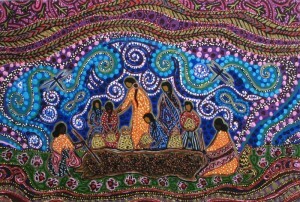 She uses some of the same patterning for her paintings as can be found in beaded works and often uses materials like beads to add depth to her work. Rather than beading a full section she will use the beads as accent points, drawing the eye in as it catches light and extends out towards the viewer. Dorion creates work that ranges from wholly abstracted form to those that focus on central figures, with many combining the two. Dorion’s figures are often women and/or an animal that carries symbolic significance. 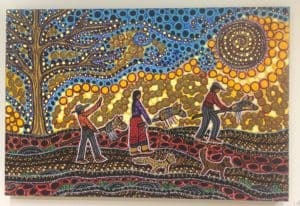 For most of history Aboriginal art has been a two-fold item. The beautiful works that they created often were attached to a utilitarian item, creating a juxtaposition between functionality and art object. As new mediums began emerging, such as ledger drawings, the forms and function of Aboriginal art began to transform. Leah Marie Dorion’s work fits well within this transformational space, using new and old materials, mediums, and themes. As new ways of expressing Aboriginal and Métis culture emerges through the arts the use of traditional stories and symbols continues to pay homage and tie it to the past while it continues to grow and flourish under each new generation’s expression of it.